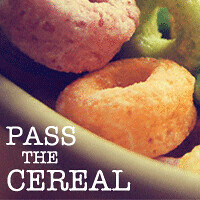 Pass the Cereal: An awesome gift for his sister! An awesome gift for his sister! Look what Jack made for EJ's birthday present!!! So gorgeous right? I can't wait to see her face light up when she gets it! Jack is sure she is going to scream (because "she screams when she gets really excited mom!"). We also found a great tiger book at the zoo gift shop last week. So a beautiful tutu AND a tiger book? Best brother ever! 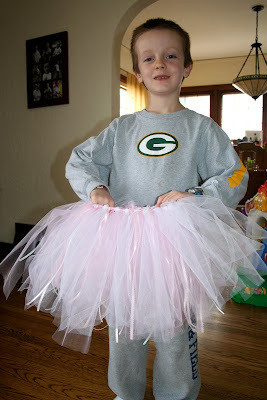 Anyway, back to the tutu. I found this amazing tutorial ages ago...literally...and have had it in my stack of great ideas to copy just waiting for the perfect time. This was it! Basically you cut a piece of elastic to waist-size and then sew the ends together to make the waist-band. Cut tulle and ribbon to double whatever length you want (we cut everything for ours to 2 feet in length...so the tutu is about 1 foot long when completed) and then loop it around the elastic. There are great step-by-step pics on the tutorial, but basically you fold the ribbon/tulle in half and put it under the elastic. Bring the two ends up and through the "loop" end, and then pull tight. So easy enough for a 6 year old to master after one time of watching! We had a bit extra of the tulle, but EJ also has a small belly and it is a very full tutu, so I think two spools would be good for most kids. I had wanted to get one more spool of pink, but the store was out so we settled for 2. Jack did run out of pink ribbon...in the end it would have been best to have 3 pink, so probably between 35 total yards of ribbon would be best. Jack could have worked on this for a solid week! It did take him two naptimes of solid work to get the job done. He made a pattern...white tulle, white ribbon, pink tulle, pink ribbon...and had to go back a couple times to fix mix-ups so that ate up a little time. He got so focused though and really wanted it perfect. At one point, I was helping him fix a pattern mix-up and I put the ribbon on the opposite way of what he was doing and he made me fix it. 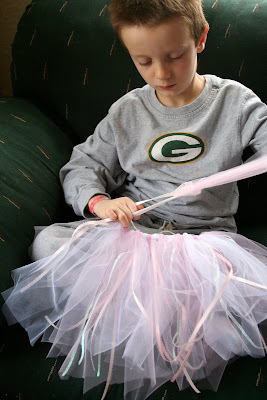 I hadn't realized but he was looping all the the tulle and ribbon the same way! This could really be a quick project though if you weren't as intense as Jack. It probably took me a solid hour to cut all the ribbon & tulle to size, as well as get the elastic all set. I'm not sure how long it would take to loop everything on to the elastic (as an adult) but I do plan to keep this in the arsenal of handmade gifts for kids sure to get an amazing response! Thank you so much Gabrielle for the idea and for inspiring me to encourage my children to make gifts for each other. The pride in Jack's face right now says it all! SO cool!!! i love how hard he works at his projects!! ej is going to be ecstatic with this gift! and i think YOU'RE inspiring me to have the kids make each other gifts!! fantastic job jack! hmmm...now i'm re-thinking mine...maybe i too should have "older brother" give it a try! EJ will LOVE it! What a sweet big bro and lovely project.